Welcome back for Day 2 of May Sneek Peaks! I hope you enjoyed yesterday's peeks! 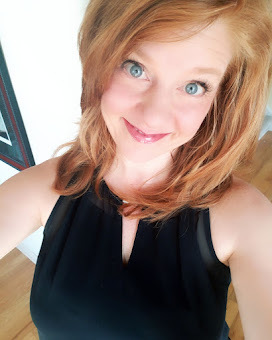 Today is all about Wedded Bliss!! If you've been looking for something new to add to your wedding collection of stamps, today is your day! I have two projects. The first features the Happily Ever After set. For my first project, I stamped the flowers from Happily Ever After in Versamark on the Kraft cardstock and embossed them with black embossing powder. I stamped "Mr. & Mrs." onto a piece die cut with the NEW Band It Die. The "&" was stamped and embossed in black and the "Mr./Mrs." was stamped and embossed in white. The leaves were stamped in olive ink, hand cut and adhered to frame the sentiment. My second project features the Curly Swirlies Dies. I die cut the swirls out of green cardstock so that they would mimic stems for the flowers. The flowers are from the Happily Ever After set, as well as the "LOVE" sentiment. The papers I used are from the Walnut Grove Collection from Pebbles. The flowers were stamped in Frost White ink onto patterned paper, embossed in white and cut out. 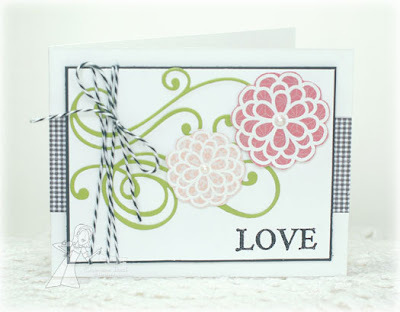 I added pearls to the centers of each flower and some Beetle Black Doodle Twine to finish the card. I hope you've enjoyed today's peeks! 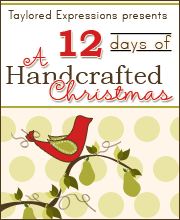 Be sure to check out what the rest of the Baker's Dozen has to show you today!! 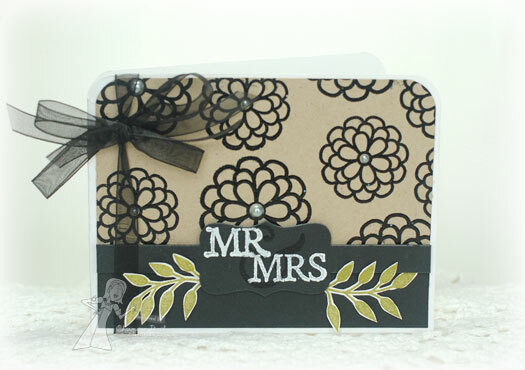 Love how you embossed the flowers on both cards! The kraft and black are so pretty together too, beautifully done! These are both so pretty, Charmaine! 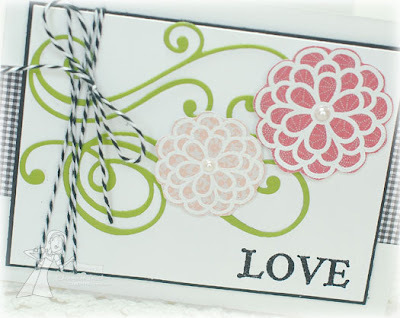 Your embossing looks fabulous and I love the pearls! Love how elegant both of these cards are, Charmaine! 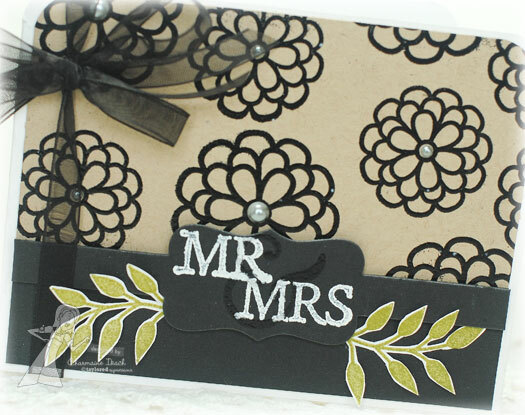 The kraft/black with a hint of olive is very classy and the swirls look awesome with the flowers on the second! So beautiful, Charmaine! Love the boldness of the first and the softness on the second! Both cards are beautiful...the black and kraft Mr & Mrs card is sooo classy and I love the curly swirlies die cuts on the second!!! !